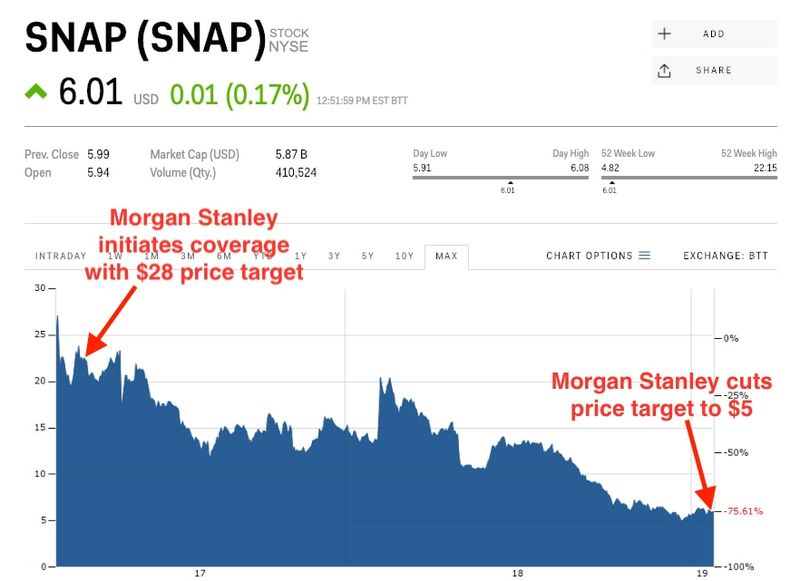 Snap‘s price target was slashed from $7 to $5 at Morgan Stanley. The bank maintained its “underweight” rating. Morgan Stanley was the lead underwriter for Snap’s initial public offering in March 2017. When the firm issued its first research note on Snap, it had a $28 price target and “overweight” rating. Snap has tumbled 65% since going public and has lost popularity since its app’s redesign in February 2018. Snap‘s lead initial-public-offering underwriter, Morgan Stanley, slashed its price target for the stock, from $7 to $5 — 17% below where shares were trading, and maintained its “underweight” rating. The team said that it doesn’t expect Snap to generate positive free cash flow until 2022, and that its bear case for the stock is $3. In March 2017, Morgan Stanley led Snap’s IPO, raising $3.4 billion. Shares were priced at $17 apiece before opening for trading at $24. Nearly a month after Snap debuted, on March 27, 2017, Morgan Stanley issued its first research note on the social-media company, assigning a $28 price target and an “overweight” rating. Within 24 hours, the bank issued a correction on its note, changing a range of important metrics in its financial model — but not its $28 target. 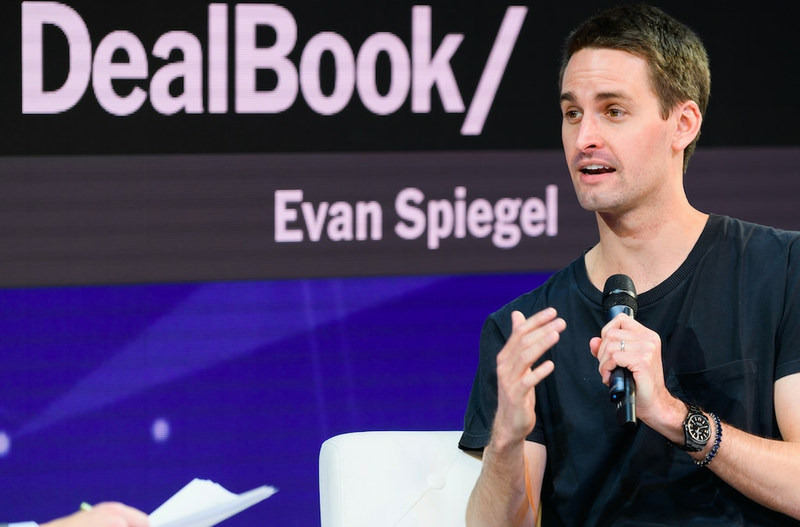 Then, in July 2017, the bank’s analysts admitted they were “wrong about Snap’s ability to innovate and improve its ad product.” The team downgraded Snap to “neutral” and trimmed its price target from $28 to $16. After trading near Morgan Stanley’s price target later in 2017, Snap skyrocketed above $20 following blockbuster quarterly earnings out on February 6, 2018. But the rally didn’t last long. On February 21, social-media personality Kylie Jenner blasted the app’s redesign and said her days of using the Snapchat app were over. Shares have since fallen 70% as the company lost popularity following its redesign, and had to deal with sustained pressure from Facebook and Instagram, which has contributed to a declining user base. In August, the company said in its second-quarter earnings release that it had suffered its first decline in sequential daily active users. That trend continued in its third quarter, when the company said its number of daily active users fell by 1% and that it expected further declines in the fourth quarter. Snap is set to report fourth-quarter earnings on February 4, and Morgan Stanley says third-party data suggests Snapchat downloads have declined 15% on an annual basis, indicating the weak user trends will continue. “We also hear of ad dollars moving away from Snap toward Facebook given Facebook’s reach and targeting advantage,” the team added. Snap was down 65% since going public.